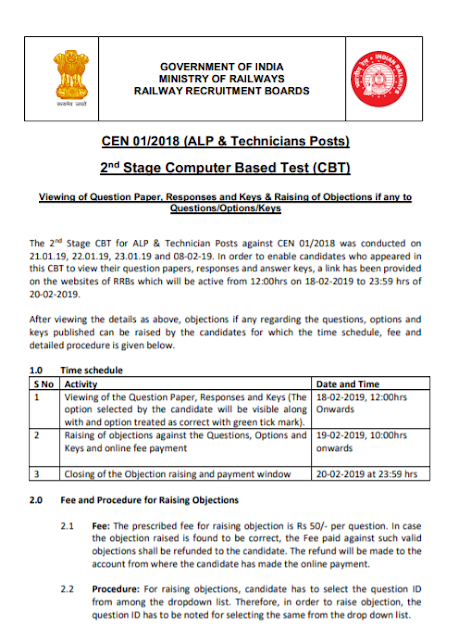 CEN-01/2018 - 2nd Stage CBT - Notice on viewing of Question Paper, Responses and Keys & Raising of Objections, if any to Questions/Options/Keys (ALP & Technicians Posts). The 2nd Stage CBT for ALP & Technician Posts against CEN 01/2018 was conducted on 21.01.19, 22.01.19, 23.01.19 and 08-02-19. In order to enable candidates who appeared in this CBT to view their question papers, responses and answer keys, a link has been provided on the websites of RRBs which will be active from 12:00hrs on 18-02-2019 to 23:59 hrs of 20-02-2019. After viewing the details as above, objections if any regarding the questions, options and keys published can be raised by the candidates for which the time schedule, fee and detailed procedure is given below. 1 Viewing of the Question Paper, Responses and Keys (The option selected by the candidate will be visible along with and option treated as correct with green tick mark). 2.1 Fee: The prescribed fee for raising objection is Rs 50/- per question. In case the objection raised is found to be correct, the Fee paid against such valid objections shall be refunded to the candidate. The refund will be made to the account from where the candidate has made the online payment. 2.2 Procedure: For raising objections, candidate has to select the question ID from among the dropdown list. Therefore, in order to raise objection, the question ID has to be noted for selecting the same from the drop down list. Further, in case the candidates wants to raise an objection as incorrect answer key then the candidate has to note the correct option ID from the FOUR option IDs available on the top right corner of the question. The correct option ID as per the candidate may be selected from the drop down list of option IDs and then submitted. Similarly for other type of objections such as All options incorrect, Incorrect / Ambiguous question, Multiple correct answers, Translation error, Any other mistake etc candidates may select the type of objection and furnish reason/supporting references in the explanation box. Candidate has to first decide based on their review, as to for how many questions they wish to raise objection and then start raising the objection as detailed above. 3.0 Candidates are advised to raise objection(s), if any, well before the final date and time i.e. 20-02 2019, 23:59hrs after which no representation from the candidates on the questions/options/keys etc will be entertained.